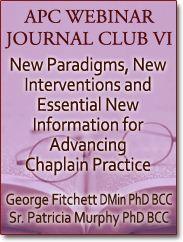 WJC6 Session 5, Does Chaplaincy Need a New Paradigm? When does accumulating evidence suggest the need for a new paradigm for chaplaincy? The author of the article we will discuss in this webinar has followed the research about resilience by psychologist George Bonanno and others. Based on that research he makes the case that chaplains should be paying more attention to patient and family resilience and the factors that contribute to it. In this webinar we will review some of the research about resilience and its implications for chaplain practice. To become familiar with recent research about resilience as a response to potentially traumatic events. To critically consider the claim that this research provides the basis for a new paradigm for chaplaincy practice. Reading: Spidell S. (2014). Resilience and professional chaplaincy: a paradigm shift in focus. Journal of Health Care Chaplaincy 20(1):16-24.